Thanksgiving Day eve was a travel day for the Owls, their fans and family. 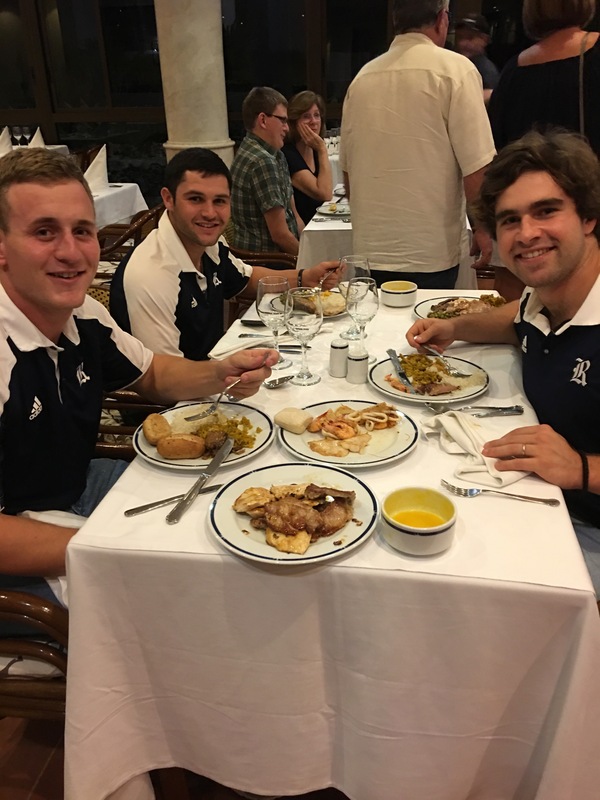 While the group of fans made it down on an earlier flight and enjoyed a three-hour bus tour from Veradero through Matanzas to Havana, the team arrived at the Melia Habana hotel at 8:10 p.m. local time. From left: Dayne Wunderlich, Robbie Lammons and Andrew Dunlap. As soon as coach Wayne Graham, his staff and team members were able to get checked into their rooms and drop off their luggage, they joined the rest of the party for a buffet dinner in the hotel. With the national holiday tomorrow, we asked some of the guys what their favorite thing about Thanksgiving Day is. The Owls will celebrate their holiday away from their family and country, but they’re going to stay busy. First thing in the morning the team will hold its first Cuba practice. Then they’ll have a classroom session with Professor Luis Duno-Gottberg and the Cuban Baseball Federation. To end the day, the team will join family and friends for a dinner at La Divina Pastora. We’ll have coverage of the Owls’ first full day tomorrow evening. Tip of the day: Cubans prefer you say “ciao” rather than “adios” when parting. 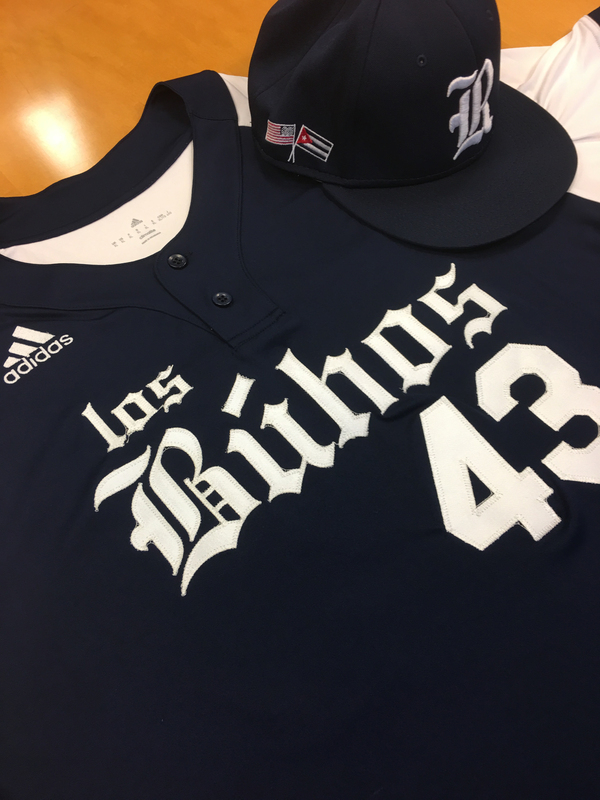 Follow #LosBuhos and @RiceBaseball on Twitter throughout the trip for updates on the team’s activities. Good afternoon from Baton Rouge. For the first time, we are not expecting any rain today. Expected forecast at game time is 90 degrees and sunny, with zero percent chance of rain! The Owls will spend their fifth and final day in town at Alex Box Stadium in a winner-take-all game against LSU at 4 p.m. If the Owls win they will be on the road for the Super Regional. There is a Houston watch party for today’s game. Join us at at the Gorgeous Gael in Rice Village. 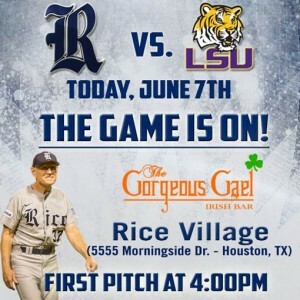 If you aren’t in Houston, or can’t make it to the Village, be sure to post a photo of you watching the game on one of our social media platforms: Twitter: @RiceOwlsBSB; Instagram: @RiceAthletics; SnapChat: RiceAthletics; as well as Facebook: https://www.facebook.com/RiceUniversityBaseball or send an email to cpool@rice.edu. As promised, here’s a photo gallery from last night’s game. Click play below to see Tommy LaVergne’s shots. To enlarge the gallery, click here. Baseball is a stats game, and our media relations team is no different. We ran the numbers a few hours ago, and the Owls’ run at the Baton Rouge Regional has generated more than 1,000 media citations in print, online, wire and broadcast reports since Thursday. Below are a just a few of the stories. Rice baseball defeated Southeastern Louisiana University and Louisiana State University June 6. Head coach Wayne Graham and players Hunter Kopycinski, Connor Teykl, Tristan Gray, Dane Myers, Evan Kravetz, Zach Esquivel, Glenn Otto, Ford Proctor, Charlie Warren, Grayson Lewis, Dominic DiCaprio and Ryan Chandler are mentioned. The headline from Baton Rouge’s newspaper The Advocate sums things up pretty nicely. ‘We just couldn’t stop them’: Rice reliever Glenn Otto quiets LSU, 10-6, forcing winner-take-all Baton Rouge regional rematch at 4 p.m. Tuesday. You can read the hometown paper’s take on the game here. The story also has a pretty good photo gallery. You can also see our Tommy Lavergne’s photo gallery by clicking play below. To enlarge the gallery, click here. After beating Southeastern Louisiana earlier in the day 15-0, the Owls needed to beat LSU Monday night to set up a game seven. And that they did. The Owls kept the pedal to the floor and scored 10 runs on 15 hits against the No. 5 team in the nation. All totaled, the Owls scored 25 runs on 29 hits Monday. With their collective backs to the wall in an elimination game, the Rice baseball team came up with 10 runs on 13 hits for a 10-6 victory over No. 5 ranked LSU late Monday evening in the NCAA Regional in Baton Rouge. Rice improved to 38-23 on the season and now forces an “extra” Regional game in the NCAA’s double-elimination format. The Owls and national seed LSU (44-19 overall) next play a Championship Final on Tuesday, June 7, where the winner advances to next week’s NCAA Super Regional round. 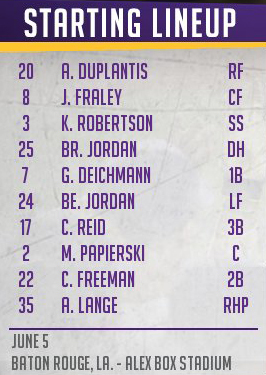 First pitch at Alex Box Stadium is set for 4 pm. Playing as the home team in the NCAA Tournament format, Rice broke the seal on the scoring with three runs in the bottom of the second inning. Connor Teykl and Tristan Gray started the inning off with singles, and a one-out walk to Dominic DiCaprio loaded the bases. Teykl made a nifty move to avoid a tag on Dayne Wunderlich’s shallow sacrifice fly and scored the first run of the game. Red-hot Hunter Kopycinski followed with an RBI single to right center, and Charlie Warren added an RBI double to right to plate one more. LSU battled back for a run in the top of the fourth on three hits. The Owls, however, came right back with a run in the bottom of the frame on a solo shot to right field by Tristan Gray to make it 4-1. The Tigers then tallied three big runs of their own on two hits. The big blow was a two-run homer by Kramer Robertson. The Owls also walked in a run that tied the score, 4-4. Rice was unfazed. The Blue & Gray answered with three matching runs on four hits, highlighted by an RBI double by Teykl and RBI single by Chandler that made the score 7-4. The Owls then added another big three-run frame in the seventh on three hits to stretch the margin 10-4. LSU would not go away so easily at Alex Box Stadium and put another two runs on the board on the strength of Jake Fraley’s two-run homer to right field. That was the last scoring of the night and the only runs Rice reliever Glenn Otto would allow. He pitched a scoreless ninth to preserve the 10-6 final and earn his ninth win of the season. In 4.1 innings of work Otto allowed just two runs on six hits while striking out five but without allowing any walks. On the offensive side of the ledger the Owls continued the explosive hitting the team enjoyed while eliminating Southeastern Louisiana in the first game of the afternoon. 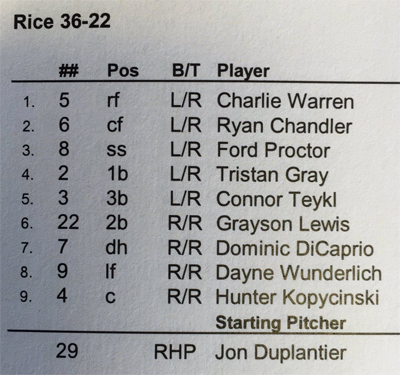 Five Rice players had two or more hits, led by Charlie Warren’s 3-for-5 day with an RBI double and a run scored. In the postgame news conferences, neither LSU’s Mainieri nor Rice head coach Wayne Graham could (or would?) say who their starting pitcher will be Tuesday. Click below to listen to LSU’s postgame news conference. It includes Tigers Jake Faley, Kramer Robertson and Mainieri. Following LSU’s news conference, Tristan Gray, Hunter Kopycinski, Glenn Otto and Graham climbed up onto the elevated stage. Click below to listen to the Owls’ comments moments after their second win of the day. Tomorrow we plan on sharing a laundry list of current media stories on the Owls, including some broadcast clips. And we’ll post a photo gallery from tonight’s game. Time to sign off. Get some sleep, Owls! The Rice bats struck for four runs in the second inning, three in the fourth and six in the fifth to give Owls’ starting pitcher Ricardo Salinas comfortable room to work. Salinas was equally productive, giving Coach Graham 7 1/3 scoreless innings and giving up only three hits in the team’s 15-0 win over Southeastern Louisiana. Overall, the Owls scored their 15 runs on 16 hits. The Lions are eliminated from the Baton Rouge Regional. Rice, now 2-1 in the tournament, will have to beat LSU twice in a row to win the regional at Alex Box Stadium. The LSU game was supposed to start at 7 tonight but just like ALL of the other Owls’ games in the tournament, the team endured a rain delay and then a lightning delay. This time the delay lasted about one hour and 20 minutes and ended Salinas’ day. The new start time for the LSU game is 7:45, so Rice will have just a brief break before facing a Tigers team with considerable pitching depth left. Dane Myers will take the mound for the Owls. To enlarge the Flickr gallery, click here. The game will be broadcast live on ESPNU. Here are your online links for the Rice-LSU game. Click below to listen to the brief postgame news conference with Ricardo Salinas and Coach Graham. The Owls left the team hotel at 10:45 this morning and are in the process of pregame fine-tuning. 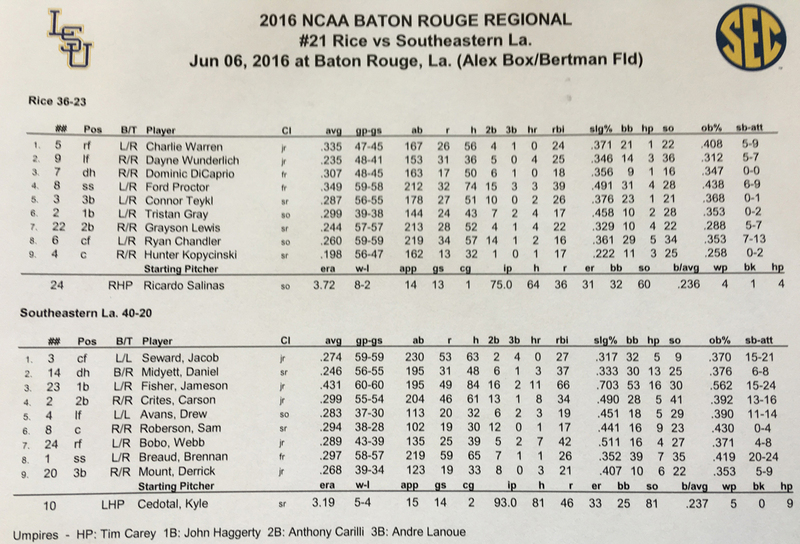 Rice faces Southeastern Louisiana for the second time in the Baton Rouge Regional at 2 p.m. at Alex Box Stadium on the LSU campus. It’s an elimination game. Rice beat SLU yesterday 7-2. SLU staved off elimination later Sunday by beating Utah Valley 3-2. And the nightcap was Rice going down to LSU 4-2. The winner of today’s game will face LSU tonight. LSU is 2-0 in the tournament and in the driver’s seat. Rice and SLU need to win three games in a row to move on to the Super Regional. 1999: Earned our second trip to the College World Series by defeating Southwestern Louisiana (Louisiana-Lafayette) 8-3 at the Astrodome to win the Super Regional. Win – Nichols 15-3. Loss – Templet 7-5. Save – K.-Nicholl (8). E – Curry (5), Nelson (17), Hawkins (3). DP – Rice Owls 2, USL 1. LOB – Rice Owls 5, USL 11. 2B – Williams (22), Smith (11), Baker (23), Hawkins (12). 3B – Thames (6). SB – Gray (19), Feehan 2 (18), Gill (19). CS – O’Dwyer (7). SH – Fox (6). SF – Williams (3). 2004: Fell one game short of battling back from an opening-game loss to TSU. Defeated Texas A&M 3-1 in the first game, but lost 7-5 in the second. Win – Niemann (6-3). Loss – Z.Jackson (10-6). Save – none. Boggs (11). SH – Reagan (7). SF – Janish (4); Morris (1). CS – Schindewolf (3). Win – Nicholson (3-0). 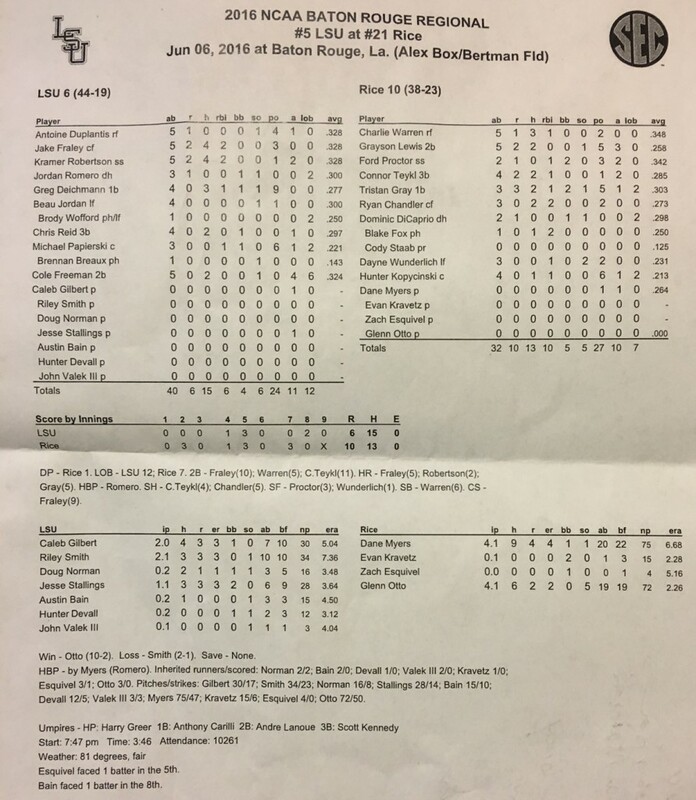 Loss – Humber (13-4). Save – none. Mavroulis (4). SB – Pennington (11). 2009: Eliminated from the Super Regional at LSU, 5-3. Win – Coleman (13-2). Loss – Berry (7-2). Save – Ott (16). 2010: Eliminated Louisiana-Lafayette in the morning, but was then eliminated by host Texas. Win – Ojala (6-2). Loss – Hubbell, T (4-4). Save – none. DP – Rice 2. LOB – Rice 8; UL 5. 2B – Mozingo (13); Seastrunk 2 (17); Fuselier, A (15). HR – Rathjen (13). HBP – Ratterree; Keefer, C. SF – Hague (4). Win – Jungmann (7-3). Loss – Anagnostou (3-5). Save – none. – Moldenhauer. SB – Etier. CS – Rathjen. Follow us on Twitter @RiceOwlsBSB. After a long day of completing a rain-delayed game and then playing the No. 1 seed LSU Tigers, the Owls returned to their hotel after 11 p.m. The following is adapted from Rice baseball SID John Sullivan’s news release. 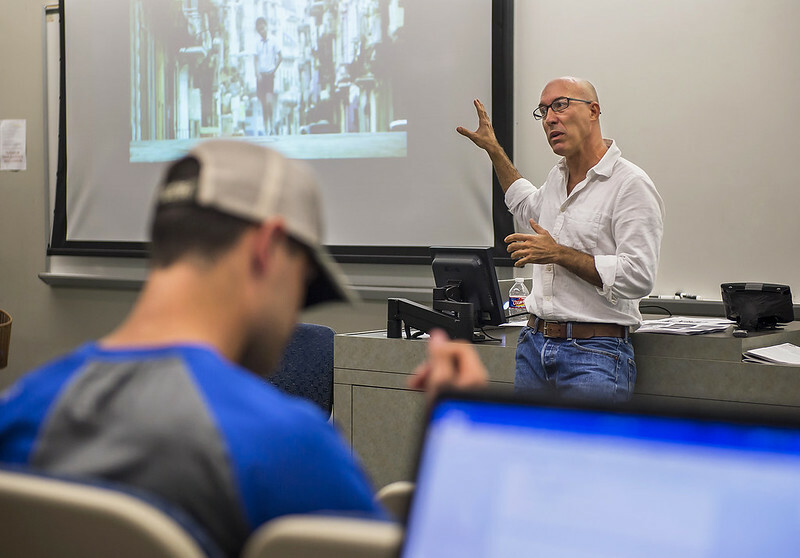 Photos are courtesy of Rice University photographer Tommy LaVergne. Down but not out, the Rice baseball team was defeated by No. 5-ranked LSU 4-2 in the NCAA Tournament winner’s bracket game late Sunday night on the road in Baton Rouge, La. The Owls are now 36-23 on the season, but with a chance to play more baseball. The Blue & Gray next meet recent first-round foe Southeastern Louisiana in a 2 p.m. elimination game Monday, June 6. To see the Flickr gallery full screen, click here. Facing the Tigers on the road is a tough-enough task, and the Owls did not help themselves issuing three walks in the bottom of the first inning. LSU made free passes costly by exploding for four runs. The Owls were quickly in a one-out, bases-loaded situation when the Tigers’ Greg Deichmann lined a pitch into fair territory down the right field line. The ball rolled into foul territory, then past the warmup mound and underneath a large wooden bull-pen bench in an unmarked area in use by staff enjoying the early Tiger rally. 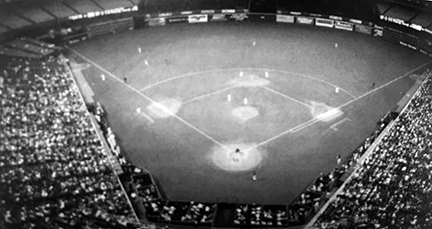 As the 10,282 fans at Alex Box Stadium went wild watching four runs come home, the play was initially ruled a ground-rule double. That initial call was, however, overturned and the Owls were down 4-0. Rice starting pitcher Jon Duplantier resolutely settled down and proceeded to post four shutout innings that kept the Owls from going to bull pen until at least the sixth. Rice continued to fight. In the top of the fifth, senior Grayson Lewis connected on a 1-0 pitch for a towering home run to left field. His fourth long ball of the season made it 4-1, but the Blue & Gray wasn’t finished. In the top of the sixth, with rain beginning to increase, Charlie Warren led off with a base hit into right. True freshman Ford Proctor blasted a one-out double to the gap in left center to drive home Warren, which made it a two-run game, 4-2. With Rice turning up the momentum, the contest was halted for 57 minutes. It was all the scoring for either team. Rice stranded runners in scoring position in the seventh and ninth, including two on base in the final frame. LSU is now 44-18 overall. The Tigers face the winner of Monday’s Rice-Southeastern Louisiana game at 7 p.m.
To listen to the postgame news conference with Lewis, Dupaltier and Coach Wayne Graham, click below. Loser will face Southeastern Louisiana tomorrow at 2 p.m. in an elimination game, winner moves on to the regional championship game at 7. It took three days, but the Rice Owls advanced to the winners’ bracket of the Baton Rouge Regional at Alex Box Stadium on the campus of LSU with a 7-2 win over Southeastern Louisiana. After being rained out Friday, the team got in six innings Saturday before rain set us up for a Sunday conclusion. After Blake Fox provided the Owls a lead 4-1 Saturday, Dane Myers took to the mound to get the save and a 7-2 Rice win. A full-game summary from baseball SID John Sullivan is below. The Owls are heading back to their downtown hotel and will be back in play later this evening to face LSU. SLU will face Utah Valley in an elimination game at 1:04 p.m. The Owls-LSU game will begin 55 minutes after the final out of SLU-UVU, so around 5 maybe? Due to NCAA broadcast rules we can’t show the final out on the field, but we can show you our fans on the final out! Audio of the postgame news conference featuring Coach Graham, Dane Myers, Ford Proctor and Blake Fox is below. BATON ROUGE, La. – Better late than never, the Rice baseball team was finally able to complete its long-delayed opening game in the NCAA Baton Rouge Regional Sunday afternoon with a 7-2 victory over Southeastern Louisiana. With the win Rice advances to face national seed, regional host and well-rested LSU on the Tigers’ home field of Alex Box Stadium on Sunday evening – weather permitting! As the Owls were departing the facility after the Sunday afternoon victory (and with another elimination game still to be played before Rice meets LSU in the late game), rain was again beginning to fall in the area. Weather conditions first pushed Rice’s opening game from Friday night to Saturday. The first six innings of the contest were completed Saturday with Rice leading 4-1, but rain and lightning then delayed all the weekend action to Sunday. The final three frames were restarted almost another 24 hours later, where Rice registered a 7-2 decision to advance to the winner’s bracket. Playing as the home team at the neutral site Rice started the scoring in the bottom of the second inning. Dayne Wunderlich drew a one-out walk and moved to scoring position with a stolen base. He advanced to third on a base hit by Grayson Lewis, but a Lion fielding error on the play gave him an extra 90 feet for a 1-0 lead. Southeastern Louisiana came right back with a run in the top of the third. Brennan Breaud hit a one-out single and alertly took second base on a wild pitch. He went to third on a ground out and scored easily Ryan Byers’ double to right-center to make it 1-1. The Owls moved back in front, 4-1, with a three-run fifth. Four hits and a Lion fielding error broke the deadlock. After an RBI by freshman Ford Proctor plated one, the final hit of the inning (and the third-straight in the two-out rally) was a big double to the gap in left-center by senior Connor Teykl that stretched the margin to three runs. The Lions were ready to re-start what seemed more like a short three-inning rematch. SLU posted a run in the top of the seventh to make it 4-2 off new pitcher Dane Myers, who started Sunday in relief of original hurler Blake Fox. That was all Myers and Owls would allow, however, and quickly proceeded to post three big insurance runs in the bottom of the eighth to re-extend the lead to 7-2. Myers earned his seventh save of the season with all 3.0 innings of work, scattering four hits while striking out two. Fox won his fifth game of the year, and the 31st of his collegiate career, by allowing just a single run on three hits and four walks while striking out four. On the offensive side, the Rice duo of Ford Proctor and Connor Teykl both finished the game with three hits each while driving in a run in an 11-hit attack. The Owls are now 36-22 on the season with more games to play. Southeastern Louisiana dropped to 39-20 is overall. Pitchers: SE Louisiana – Sceroler, Mac; Robinson, Payton(6); Von Rosenberg, Gabe(8) and Roberson, Sam. RICE – Blake Fox; Dane Myers(7) and Hunter Kopycinski. Robinson, P. faced 2 batters in the 8th.